Temperatures are rising into the 80’s which means summer has unofficially arrived in our neck of the woods! Summer is my favorite season when the Earth is fully alive and birds are in full song. 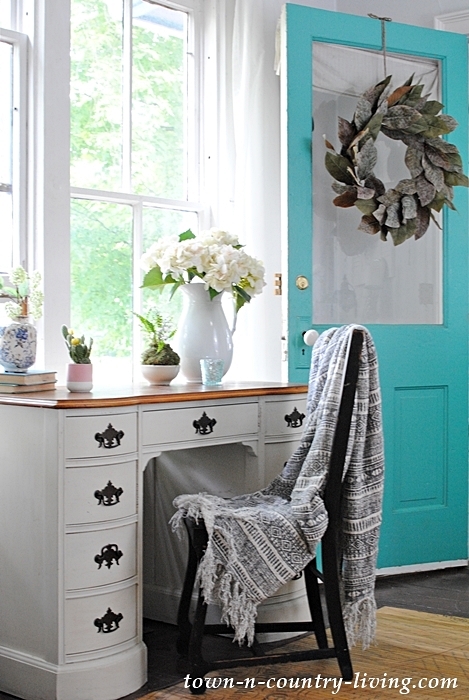 Today I’m joining a few bloggers to showcase our porches or entryways. 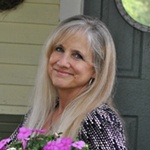 If you’re here from Ashley’s blog at Cherished Bliss … Welcome! And special thanks to Taryn at Design, Dining and Diapers for organizing today’s event! 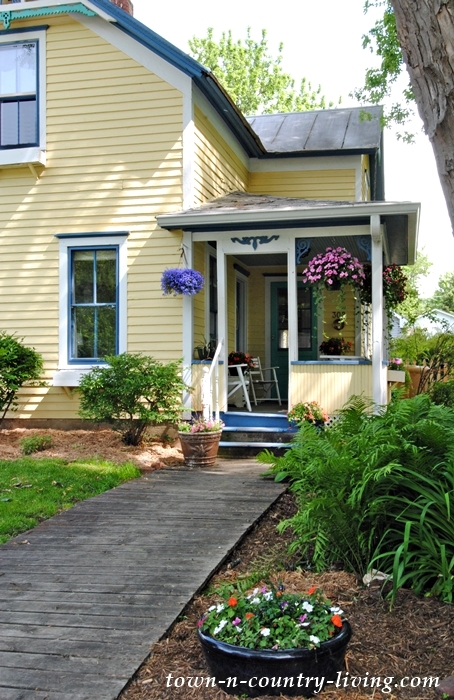 My farmhouse entry and porch feel lighter and fresher already with colorful summer flowers. 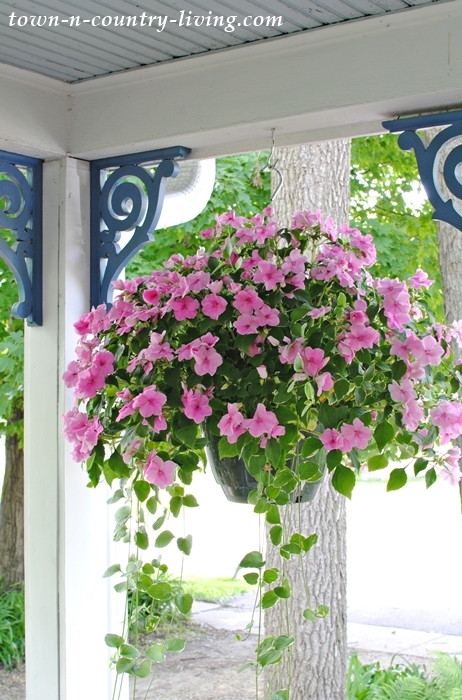 Every summer I hang overflowing baskets of impatiens on the front porch. I love the color and impatiens are perfect for this shady area. The hostas and astilbe in front of the porch are looking healthy this year, likely due to all the rain we’ve had. Impatiens are low-maintenance annuals that add a lot of color to shady areas. Aren’t they beautiful? I still have a few more impatiens to plant out in the garden beds. Other than that, all our planting is done for the season, including the vegetable garden. 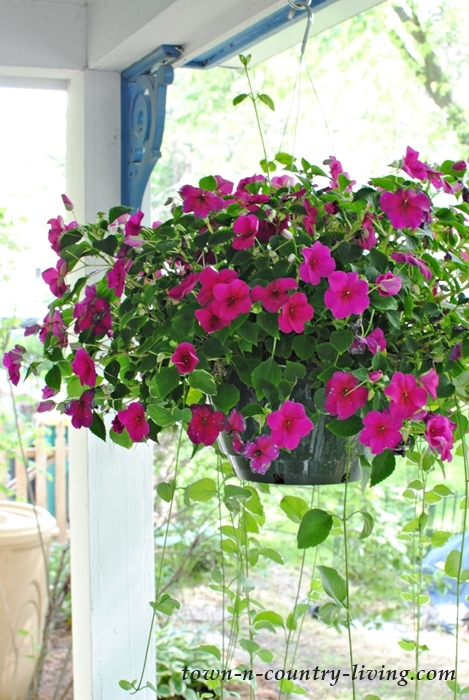 A few more baskets of impatiens on the porch add pops of color. I like pairing the bright, warm orange impatiens with the pinks and purples. 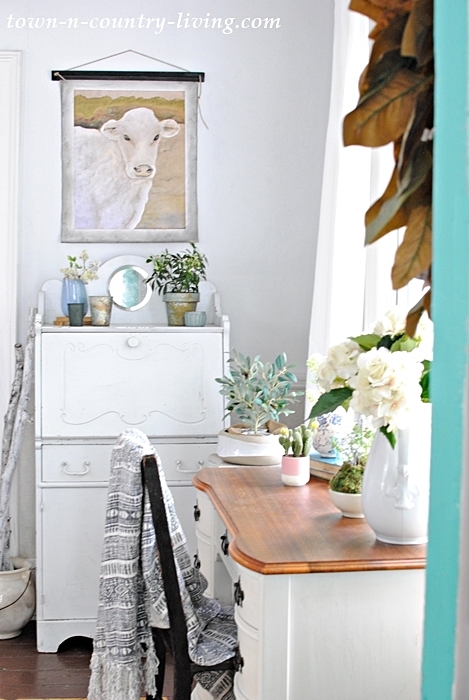 Inside my farmhouse entry I’ve made just a few small changes for the summer season. I swapped out the gray-patterned curtains for lighter, white curtains from IKEA. The curtains cost less than $10 for two panels. A cactus on the desk gives a nod to the summer heat outside. 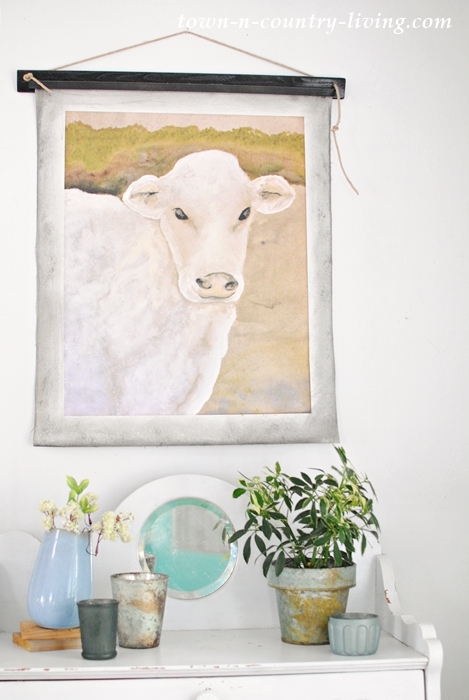 I still have Bessie the cow hanging in my farmhouse entry to greet family and friends. I’m keeping it simple this summer and planted about half the flowers I normally plant. 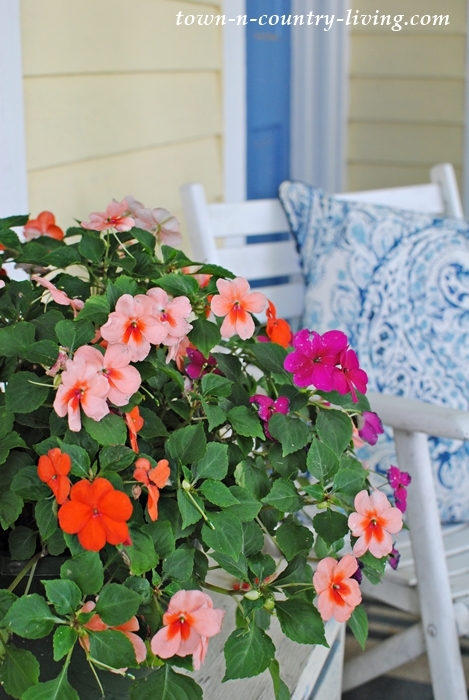 But the porch always gets a good dose of summer color with my favorite impatiens! 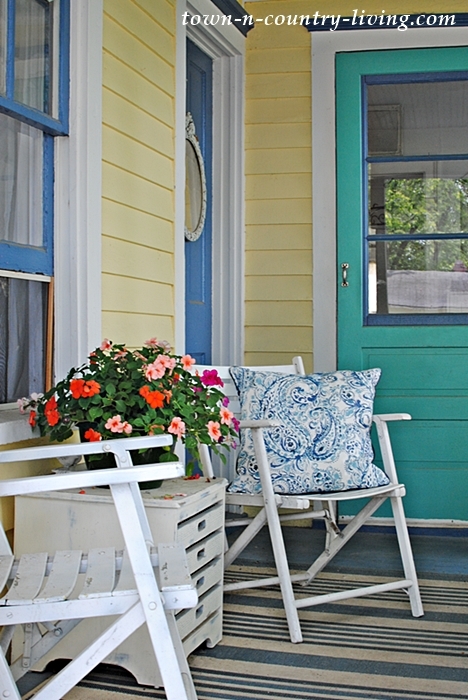 Next up on the tour of summer entryways and porches is Shannon from Fox Hollow Cottage. 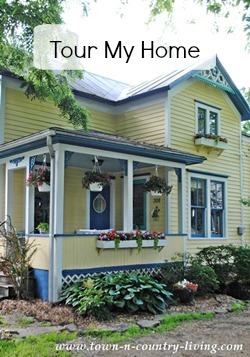 I love her home and have followed her blog for several years now! 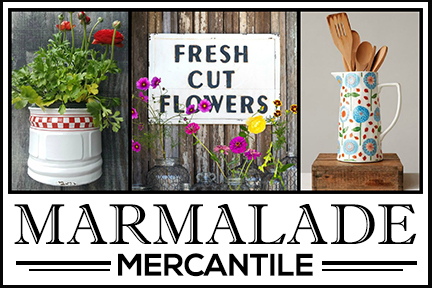 What are some of your favorite summer decorating ideas? Jennifer, I think I could sit on your front porch and watch the summer day away! It’s absolutely lovely and so quaint. 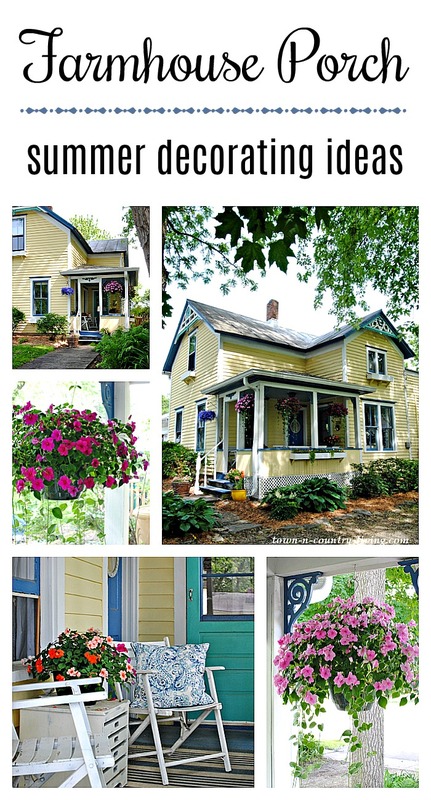 The hanging baskets are just the perfect touch! Your porch looks beautiful, Jennifer. I love impatiens and I have planted some of them this year as well. 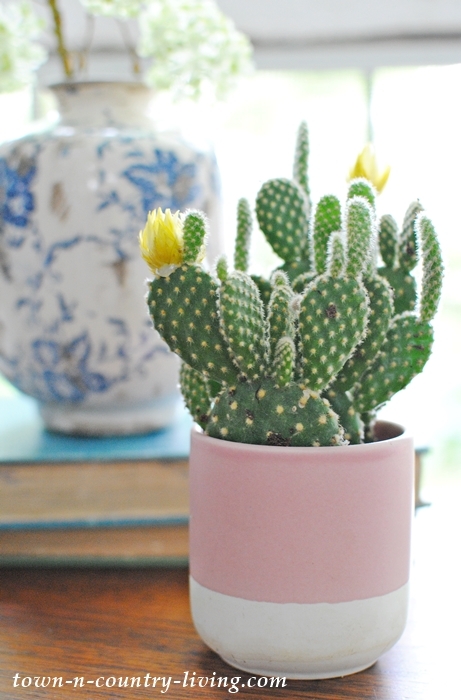 Love your cactus in the cute little pink planter too! 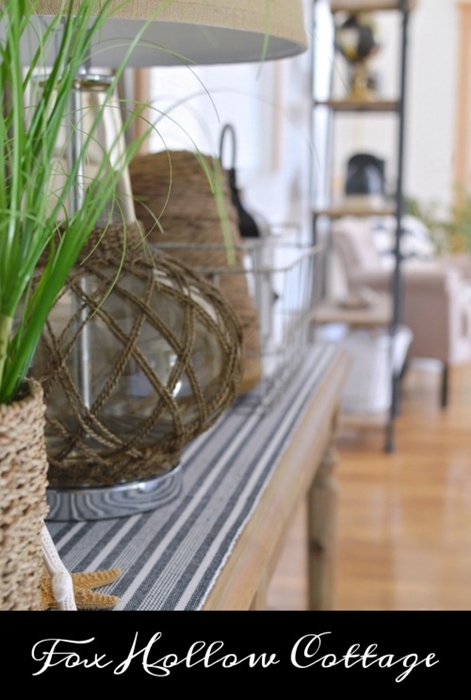 Your entryway looks so cool and relaxing. 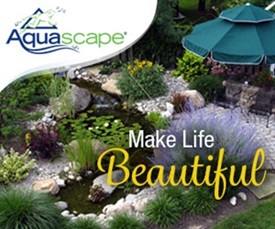 Summer should be a simple time and our surroundings should reflect that – and yours definitely does. The nice weather is gone soon enough here in the midwest, so we must enjoy it while we can. My small garden is also planted and doing well but I’m still popping in yet another annual (and another and so on) for color in my flower beds, trying to stay ahead of the weeds. 🙂 Impatiens are one of my favorites also and I have them at the back of my house in shady areas. 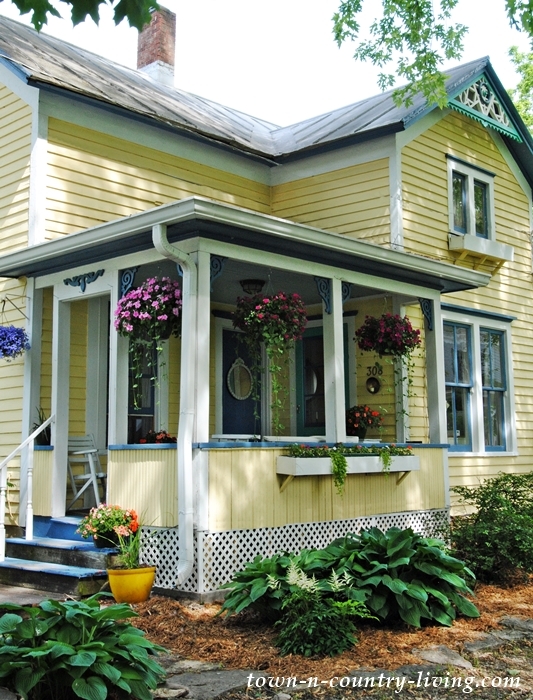 Thanks for sharing your pretty porch and entry. Looks like just the place to sit and visit with friends. Your flowers are so pretty. I love Bessie! And your flowers are beautiful! So welcome, after the winter!! Oh my goodness…that yellow! Such a beautiful home, Jennifer! I just love that cow painting!!! Such a sweet porch, looks so relaxing. A warm and cozy sumer look. Lots of great touches love the cow!